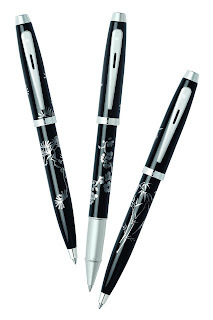 This holiday season for the pen lover on your gift list, Sheaffer is introducing a new collection, the Friends of Winter. These three designs, Bamboo, Pine, and Plum, are available in Fountain Pen, Roller Ball and Ballpoint. Each pen comes in Gloss Black with Nickel Plate Trim. Prices range from $30 to $40. I have fallen in love with these pens! They would be a great Christmas Gift! Stop by their website and check them out! !